Citation Information: JCI Insight. 2016;1(19):e86934. https://doi.org/10.1172/jci.insight.86934. The repulsive guidance cue SLIT2 and its receptor ROBO2 are required for kidney development and podocyte foot process structure, but the SLIT2/ROBO2 signaling mechanism regulating podocyte function is not known. Here we report that a potentially novel signaling pathway consisting of SLIT/ROBO Rho GTPase activating protein 1 (SRGAP1) and nonmuscle myosin IIA (NMIIA) regulates podocyte adhesion downstream of ROBO2. 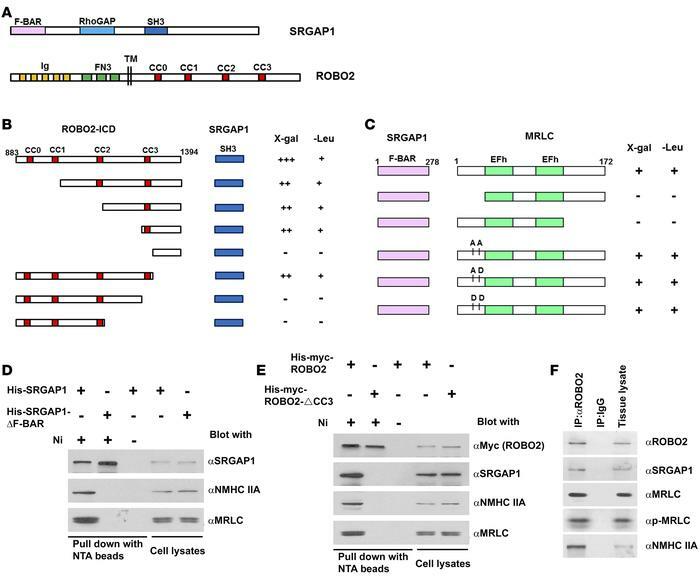 We found that the myosin II regulatory light chain (MRLC), a subunit of NMIIA, interacts directly with SRGAP1 and forms a complex with ROBO2/SRGAP1/NMIIA in the presence of SLIT2. Immunostaining demonstrated that SRGAP1 is a podocyte protein and is colocalized with ROBO2 on the basal surface of podocytes. In addition, SLIT2 stimulation inhibits NMIIA activity, decreases focal adhesion formation, and reduces podocyte attachment to collagen. In vivo studies further showed that podocyte-specific knockout of Robo2 protects mice from hypertension-induced podocyte detachment and albuminuria and also partially rescues the podocyte-loss phenotype in Myh9 knockout mice. Thus, we have identified SLIT2/ROBO2/SRGAP1/NMIIA as a potentially novel signaling pathway in kidney podocytes, which may play a role in regulating podocyte adhesion and attachment. Our findings also suggest that SLIT2/ROBO2 signaling might be a therapeutic target for kidney diseases associated with podocyte detachment and loss. ROBO2, SRGAP1, and nonmuscle myosin IIA (NMIIA) form a complex. (A) Diagrams showing the domain structure of SRGAP1 and ROBO2 proteins. Abbreviations: F-BAR, FES-CIP4 homology and Bin/amphiphysin/Rvs domain; RhoGAP, GTPase-activator protein (GAP) for Rho-like GTPases domain; SH3, Src homolog 3 domain; Ig, immunoglobulin domain; FN3, fibronectin type 3 domain; CC0, CC1, CC2, CC3, cytoplasmic conserved region 0, 1, 2, and 3; TM, transmembrane domain. (B) Yeast 2-hybrid assay shows a positive interaction between the ROBO2 intracellular domain (ROBO2-ICD) and the SH3 domain of SRGAP1. The interaction is mediated by the proline-rich CC3 motif in ROBO2 and the SH3 domain in SRGAP1. LacZ reporter (X-gal): +++, yeast turned dark blue; ++, light blue; –, white in 24 hours. Leucine reporter (-Leu): +, yeast grew; –, yeast did not grow. Numbers indicate residue positions in the full-length ROBO2 protein. (C) Yeast 2-hybrid assay shows a positive interaction between the F-BAR domain of SRGAP1 and the myosin regulatory light chain (MRLC). Deletion of either N-terminal residues 1–33 or C-terminal amino acids 130–172 in MRLC abolishes the interaction. Substitutions of phosphorylation sites Thr18 and Ser19 with Ala-Ala, Ala-Asp, or Asp-Asp do not affect the interaction of MRLC with SRGAP1. EFh, EF-hand calcium-binding motif. Numbers indicate residue positions in the full-length proteins. (D) Full-length SRGAP1, not SRGAP1 with F-BAR deleted, coprecipitates with NMIIA heavy chain (NMHC IIA). His-myc-SRGAP1 or His-myc-SRGAP1-ΔF-BAR was expressed in HEK cells and precipitated with Ni-NTA beads (lanes 1 and 2) or control beads (lane 3) in the presence of SLIT2. (E) Full-length ROBO2, not ROBO2 without CC3 (ROBO2-ΔCC3), coprecipitates with SRGAP1, NMHC IIA, and MRLC. His-myc-ROBO2 or His-myc-ROBO2-ΔCC3 was expressed in HEK cells and precipitated with Ni-NTA beads (lanes 1 and 2) or control beads (lane 3) in the presence of SLIT2. (F) Coimmunoprecipitation of newborn mouse kidney endogenous ROBO2, SRGAP1, MRLC, p-MRLC, and NMHC IIA. Precipitates were prepared using mouse monoclonal anti-ROBO2 antibody and IgG antibody was used as a negative control.